Johnny Depp, Marlon Brando, Elpidia Carrillo, Frederic Forrest, Luis Guzman, Marshall Bell, Clarence Williams III, Max Perlich, Cody Lightning, Nicole Mancera, Floyd Red Crow Westerman. 123 minutes. 'It's your life.' McCarthy commenting to Raphael on his fateful decision. Johnny Depp is one of the most respected and loved actors working in cinema today, and yet many viewers are unaware that he directed a film in 1997. The film has never been released in the USA at the behest of Depp himself. THE BRAVE got a standing ovation at the Cannes Film Festival (where it was shown in competition), but days later, the American reviews were overwhelmingly negative. Depp was so affected by the reviews that he decided not to release his movie Stateside. Viewers outside the States had the opportunity to watch the movie, but due to it's subject matter and tone, it promptly disappeared anyway. 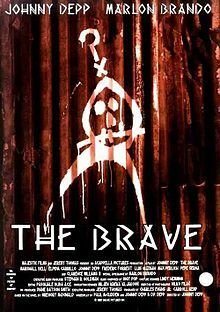 THE BRAVE is a film suppressed by it's creator in one country, and ignored in all the countries it was released in. After THE BRAVE, Depp never directed again, until he began working on a Keith Richards documentary. Depp's film (co-written with his maternal older half-brother, D.P. Depp from Paul McCudden's original draft, and based on a 1991 novel by 'Fletch' creator Gregory McDonald) is an excellent motion picture that, being a very personal project for him, reveals a lot about the man of many faces. It's sad that the reception afforded the film has stopped him from picking up the directorial reins again (until his upcoming Keith Richards documentary), for he clearly has talent (not surprising since he has worked with a lot of great directors). THE BRAVE tells the story of Raphael (Depp). He's a Native American, three time loser, just out of prison (where he served four years). Raphael lives with his wife (Elpidia Carrillo, SALVADOR, 1986) and two daughters in a California shanty town that backs out onto a rubbish dump. He's dirt poor, alcoholic, with no prospects, and to add to his woes, the shanty town will soon be demolished by a salvage company. Despairing at his inability to provide for his family, he accepts $50,000 to be killed on camera in a 'snuff film'. He is given a down payment (taken out of a drawer by his employer as though it is nothing to him), and a week to prepare for his fate. Raphael uses the week to reconnect with the family he has not seen for four years, to bring some joy into the lives of his family and community, and to come to peace with his approaching death. During this time, he ironically learns to enjoy life. The film is about as dark as it gets. It's a film that was never going to pack multiplexes, and strong reviews would have helped it's commercial chances. But it's a beautiful film. The first ten minutes or so have no dialogue and effectively visually establish Raphael's situation and mindset. He allows the people in the community their dignity. They work hard to survive, to stay positive and healthy. They have kept their humour and loyalty to their family. The scenes where Raphael tries to bring happiness to his family and friends (fixing the funfair, having a festa) have a joyful, playful, innocent quality. When Raphael makes the deal to appear in the 'snuff film', it's clear visually and aurally that he is entering Hell. He is interviewed by McCarthy, an overweight, avuncular, soft-spoken man in a wheelchair. McCarthy represents Raphael's transition into the next life. He philosophises, he seems to befriend Raphael, but it's obvious he has given this speech many times before and it's all an act. McCarthy is played by Marlon Brando, an idol and friend of Depp's, and his co-star in DON JUAN DE MARCO two years previously. It's interesting casting because it recalls Brando's role in APOCALYPSE NOW (1979), where he was a similarly dark figure shrouded in death, who philosophised and prepared Martin Sheen to kill him. In this movie, he's more menacing for being so friendly, and is in fact preparing Depp for his death, and not his own. The film's power comes from the contrasts between it's light (the community and family scenes) and darkness (the Brando scenes, and the scenes with the psychotic Marshall Bell who shadows and menaces Depp to ensure he doesn't try to run). The 'light' scenes are touching and often spiritual (Depp's conversations with Clarence Williams III's Father Stratton), the 'dark' scenes have a truly disturbing, deathly feel to them. Every scene of joy is punctuated by short, sharp shocking reminders of Raphael's approaching fate. Interestingly, in the book, the lead character is not a Native American. It was Depp's decision to make him Native American. Depp considers himself part-Native American, saying in 2011 that 'I guess I have some Native American (in me) somewhere down the line. My great-grandmother was quite a bit of Native American, she grew up Cherokee or maybe Creek Indian. Makes sense in terms of coming from Kentucky, which is rife with Cherokee and Creek.' The same year the deal to make the film was finalised at Cannes (1995), his Native American-themed picture with Jim Jarmusch, DEAD MAN, was released. THE BRAVE ties in with what can be learned from Depp's career choices. He has never been scared of making films that tackle dark subjects, are quirky and unique, or might be considered controversial. Depp is attracted to (and seems to empathise with) the character of the outsider, the misfit or the oddball. Often such characters have to fight to be heard, to achieve their dream or to simply survive. He seems to be fascinated by what qualities are brought out in people under duress, whether it be through external or internal factors. Raphael is a man who has come to a crossroads in his life, and realises that the only way to ensure his family's survival is to sacrifice the ultimate thing: his life. In one week, he has two challenges: to make his love for his family and community felt in their souls and hearts through his actions (so that his death it will live on long after his passing), and find the courage to face death (thankfully we are spared seeing it onscreen). The title of the film has a triple meaning. Raphael is literally 'a brave', a Native American. He's a brave man for accepting the joy of life when he is in the orbit of his own encroaching death. But he is most importantly a brave man for sacrificing his life to ensure his family will be looked after. (It's also worth remembering that his death will be a particularly excruciating one - he will be tortured and killed on camera.) This of course is a parallel to Christ, who also gave up his life to ensure that his people (humankind) would be looked after. There are also two nods to Christ in the film - a hand wound inflicted by McCarthy's henchman, Larry (Marshall Bell) that looks like a crucifixion wound, and Raphael carrying bottles of water tied to a log across his shoulders that reminds one of Christ carrying his own cross to his crucifixion. 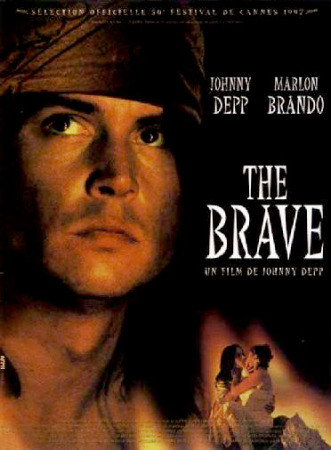 Johnny Depp himself was indeed 'brave' to make such a challenging film that risked being misunderstood and ignored, which in the end, it was. Some viewers are not going to be able to take the oppressive, bleak and unrelentingly sad atmosphere that envelops the movie. The movie offers no chance of hope or a happy ending. It's clear that Raphael hasn't even considered running from his fate, and that he fully intends to live up to his contract, making the scene where Marshall Bell's Larry menaces him by showing off the bodies of men he has killed and injuring Raphael's hand all the more surreal. He's an honourable and humble man, whose decision and acceptance of his fate forces one to ask whether one would make such a sacrifice for their loved ones. There's a conciseness, a desire to cut to the bone with the storytelling and themes, a fearlessness that marks this as very much a Johnny Depp film. The final scene is both horrifying and poignant for what we don't see but know will follow: Raphael's horrible death and a better life for his family and people (without him). Depp's directing is counterpointed by his acting in the film (which won him a Best Actor nomination at Cannes). There's nothing showy, overstated or melodramatic about either. Depp the director lets his visuals tell the story, and he finds quiet, dignified beauty in the way the community pulls together amidst a lifestyle nobody would wish for. (The opening shot is of a rubbish tip, telling us in iunflinching terms where Raphael's situation is at.) He never sentimentalises the people who inhabit the shantytown, though. And he is unflinching when it comes to the darkness, the bleakness and when it comes, the violence (in one scene Depp bites Luis Guzman's ear off, which like Raphael's injury at the hands of Larry, prefigures his own brutal demise). Brando's participation is all too brief (two scenes) but he makes his presence felt and it's one of his most memorable post-LAST TANGO IN PARIS (1972) performances. Depp no doubt sealed his involvement because of Brando's love of Native American people (their friendship would have helped). He famously sent a Native American woman to accept his GODFATHER (1972) Oscar. Frederic Forrest, who plays the oddball Lou Sr., also acted in APOCALYPSE NOW as Chef. Depp had joined the cast of TV's '21 Jump Street', (1987-9), for the chance to work with him. Another one of Depp's friends and heroes, Iggy Pop, has a cameo in the festa scene, eating a huge drumstick (!). Pop also wrote the film's subdued, haunting score. Elpidia Carrillo doesn't really get a chance to shine as Raphael's wife, but she delivers a typically strong, committed, passionate performance as the long-suffering but loyal wife. Luis Guzman (TRAFFIC, 2000) plays a less lovable character than we have become accustomed to seeing him portray (Raphael's scuzzy former crime partner with an axe to grind). THE BRAVE is a film that demands to be seen. It's a film that continues Johnny Depp's fascination and empathy with society's 'losers', is a personal project for him due to his own Native American heritage, and is essential viewing for anybody interested in his talent. The film inspires one to ask uncomfortable questions about what lengths one would go to protect one's loved ones (the film seems to suggest that Raphael's decision is a Christian thing to do), and gives one an unflinching look at the lives of society's forgotten, ignored and dispossessed. It's brutal and disturbing, but also poignant and beautiful. It's a 'brave' film, and those put off by the 'snuff' scenario should exercise some bravery themselves and seek the film out. Neon Magazine, September 1997. Article by Gareth Grundy. NATURAL BORN KILLERS producer Don Murphy's website. Murphy was working with Stone on the latter film when Stone became interested in the project. Murphy knew Ghazal from USC. AVAILABILITY: The movie is available on DVD outside the United States in barebones editions. RECOMMENDED VIEWING: DEAD MAN (1995) and THE MISSOURI BREAKS (1976).